Ohhhhhhhh, this peach cobbler. When Tom sees me coming home with a basket of peaches, he is one happy man. This cobbler is one of our favorite summer desserts. You could substitute another fruit for the peaches, but peach is by far the best. There are probably a million cobbler recipes out there–cobblers take different form in different parts of the U.S. We agree though, that this is the version for us. It is moist and a bit gooey, with a lightly crunchy crust. My version uses unbleached flour and sugar, making it a bit browner and rustic looking, but the taste is all awesomeness! I also use almond milk in place of cow milk, but either work well. Melt the butter and pour into an 11 x 13 baking dish. Add the peach slices on top of the butter. In a medium bowl, whisk together the flour, sugar and milk. Pour over the peaches. Sprinkle the brown sugar and cinnamon on top. 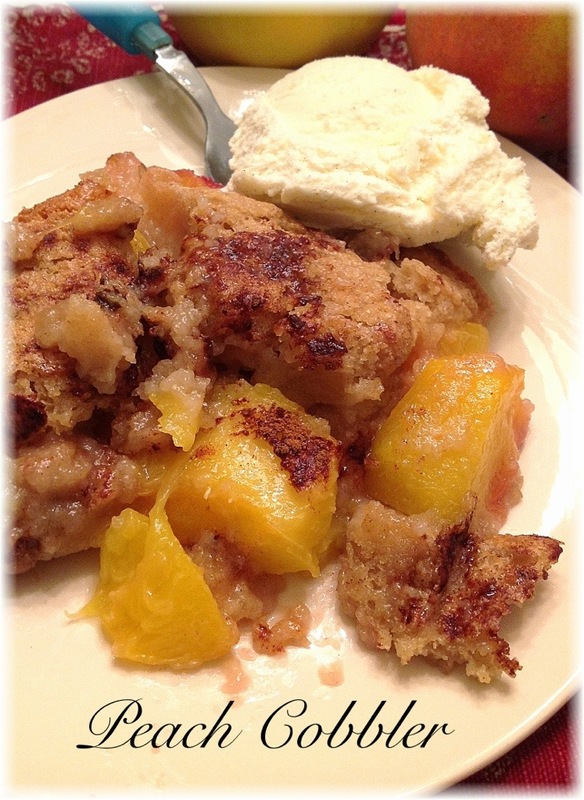 Bake for 35-40 minutes, until crust is lightly browned and the cobbler is hot and bubbly. I will have to try this tonight! That crispy sugary crust looks fantastic! I need to buy more peaches before they are gone!!! I know! We have about 2 weeks left in the season and I feel like hoarding!!!!! Love to bake with peaches. Looks this delicious. Let me know how it works for you!! Hope you enjoy!